My husband also writes children's books. 20 years in print, Sugaring tells the sweet, age-old story of gathering maple sap, the long hours in the sugar house boiling it down, and finally, the delicious product, maple syrup. But Nora isn't satisfied. She still wants something she can feed to the hardworking horses, Bonnie and Stella, and Gram knows what that something is. Click here for more about maple, and for sweet seasonal events. One of my favorite pictures, by the great Jos. A. Smith. 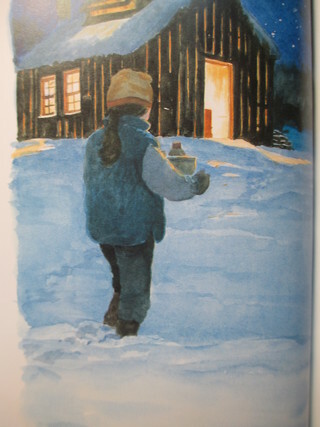 When I was a kid we made maple syrup on the farm, about 45 gallons a year. My dad set up an arch in the front yard and gathered and boiled after work. Sugar making is a lot to add onto a full-time job driving trucks, but there wasn't much else to do in the way of farm work at that time of year. I loved the sweet taste of sap, and drinking a tiny glass of hot syrup as soon as it was done. Nowadays my favorite maple product is maple butter--not the pure maple product, but a mixture of hot syrup and good salted dairy butter, whipped together until it's silky and doesn't separate. Recipe to follow soon! Yes, that's a Red Sox cap. Sugaring came out in 1996, and I talked about it in schools for many years before any child ever asked me, "Is Gramp a Red Sox fan?" "Why do you ask?" I said, and it was pointed out to me that he wore a Red Sox cap--which no one had ever commented on until finally, finally, the Sox won the series. I felt like I was participating in a moment of cultural shift. At last, Red Sox fans were lowd and proud. How many gallons of maple sap does it take to make a gallon of syrup? How does boiling turn sap into syrup? Answer: Maple sap is 98% water, and only 2% sugar. Boiling evaporates the water, and leaves the sugar. Syrup is 33% water and 66% sugar. Boiling syrup even more, like Gram does in the story, evaporates the rest of the water and leaves only the sugar. The pan the sap is boiled in is called an evaporator. It is designed to be broad and shallow, so the water will evaporate more easily. The stove the evaporator fits into is called an arch. How did Native Americans make syrup? Answer: Native Americans made sugar, not syrup. Maple sugar keeps better than syrup, and is easier to carry. Native Americans made a slash in the bark of a maple tree, and collected the sap in birch bark containers. 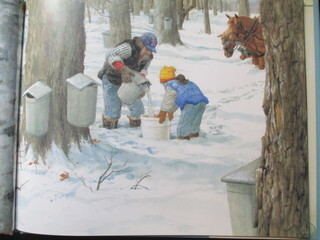 They boiled the sap by heating rocks in a fire and dropping them into containers of sap. How does maple sugar connect to Black History Month? 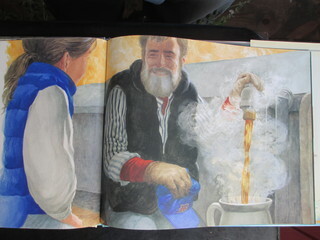 Gramp and Nora gather sap, build a fire in the sugar house, and make maple syrup. But Nora wants to give the horses, Bonnie and Stella, a maple treat. They're doing all the work. Sap trickles through Nora's fingers. Syrup is too sticky, and make Nora's fingers too much like maple treats--ouch! So Gram cooks up a sweet surprise. Yes, that's a Boston Red Sox hat Gramp is wearing. No one ever noticed until the Sox finally won the World Series. Bonnie and Stella are modeled on real horses, Suffolk Punch mares owned by my friend Jay Bailey. Jay and his wife Janet run Fairwinds Farm in Brattleboro, Vt., where they raise and train Suffolks, a rare draft horse breed.